Our team comes to work every day knowing that this may be the last portrait made for a loved one. The number one goal is to satisfy your families with a quality product – and you with exceptional service. Developed in 1990, our unique printing process uses film and hand layering of colors to build up an image. This produces outstanding reproductions from great photographs. Each portrait is a work of art, with vibrant color and depth of detail that simply can’t be generated by a copy machine. We don’t want you to worry about our product – that’s our job. Our product is fully guaranteed – at any time and for any reason including vandalism. On average, only 1.3% of our work is returned to us under our satisfaction guarantee in any given year. We reject our own work before it ships, so you don’t have to. Call us and ask anything. We love your phone calls and emails. Communication is important to us. We know you expect it. You’d be surprised what we can do for you. Our systems even communicate with you about your order’s progress. 95% of our work ships in ten working days. Proofs are returned to you in 2-3 working days. We perform a few extra steps in our manufacturing process that our competitors won’t. To us quality, durability and beauty of the end result is key in satisfying your families – now and in the long run. Because what we do isn’t just about the pictures you sell, but the memories preserved to reach across lifetimes. For every portrait developed, each member of our art department asks themselves, "Is this portrait result something I'd be proud of including on my own family member's memorial?" 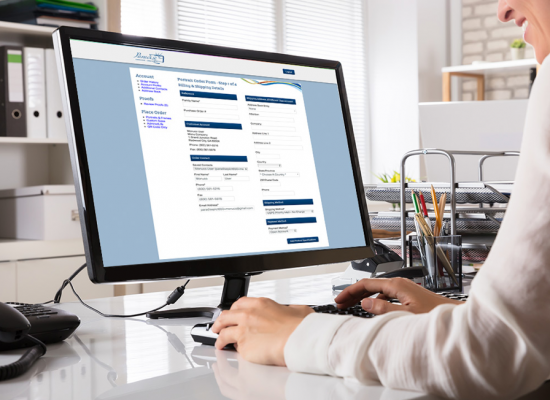 We know your time is valuable and as a result, we developed a state of the art online order system so you can place an order online with us in less than two minutes. Just provide the family name, make your choices and upload your photograph. We send you a confirmation email immediately with a PDF copy of your order. Our system also notifies you of your order’s progress from proof approvals to shipping statuses. Want to place an order by email or snail mail? We’re happy to accept your orders either way. Our portrait is made entirely in-house in Northern California. We start with sheets of steel and bags of porcelain to make your memorial portrait. 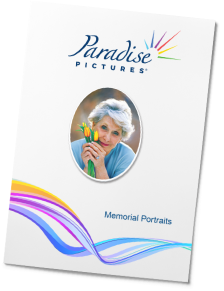 Your Paradise memorial portrait will never have orange peel or other surface anomalies. 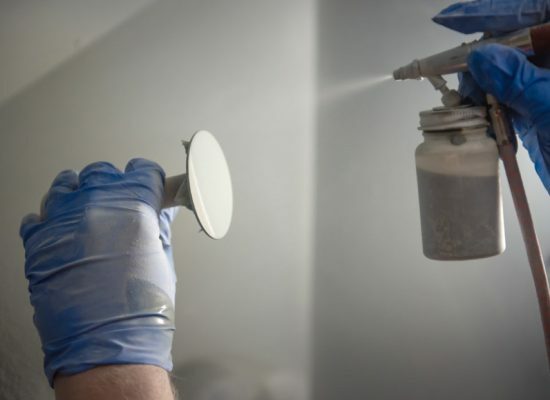 It will also always be the most durable due to our industry unique double coat porcelain enamel process. Our art department is second to none. 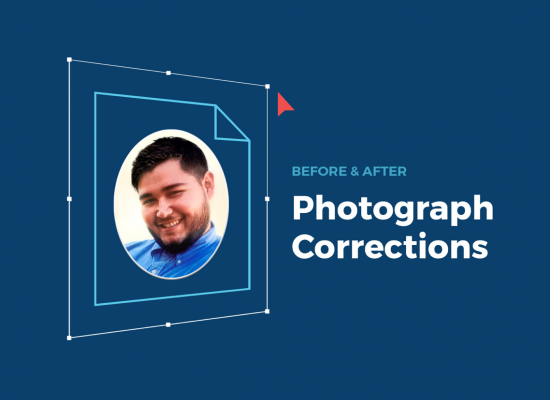 Most photographs only need a good crop and color correction before printing. But when major restoration work or background swaps are needed, you'll have a team in place at Paradise Pictures that will regularly exceed your expectations. In a recent survey, our partners rated us 4.9 out of 5 in quality & customer service. At Paradise Pictures, we understand that your role in a customer’s life is delicate and complex; you’re helping families transition through what can be considered the most difficult of times. Families turn to you for guidance; they look to you for comfort. They want to commemorate and celebrate a life in a tasteful way. They trust you to provide the best products, service and support. When you work with us, you gain a partner who cares about your success and understands your business. Just like you, we are a company that won’t settle for “good enough”. We are always working to improve our products, provide the highest quality service, and help you succeed. We know from experience that everyone at Paradise is just as invested in our families as we are and that their satisfaction is a top priority. Every time we ask for special requests, Paradise delivers an exceptional product. Their online ordering system is wonderful and saves us a lot of time… and time is money. The team at Paradise is fantastic to work with. They always take great care of me and my orders. Your company is the best vendor I deal with.